Easypromos automatically detects and classifies the traffic sources of all participants. In addition, the organizer of the promotion can control how Easypromos measures the traffic sources by customizing the UTM parameters when sharing the promotion link. When a new user visits the promotion, the platform automatically detects where the user has come from (source), and saves this information as a cookie in the visiting user’s device. If the user registers and becomes a participant, the cookie with the source is read and this is added to the participant’s registered data. Source level 1: Indicates the social network that the visit has come from, or if it is direct traffic or referral traffic. It also maps the parameter utm_source defined by the organizer. Source level 2: Second level classifier of source 1. For example, if it’s social traffic, this indicates whether it’s a recruitment action or if it’s direct traffic, or if it comes from a share button. If it’s referral traffic, this indicates the subdomain of the source. It also maps the utm_medium parameter defined by the organizer. Source level 3: Third level classifier of source 1. It might be empty or it might give additional information about level 2. It maps the utm_campaign parameter defined by the organizer. 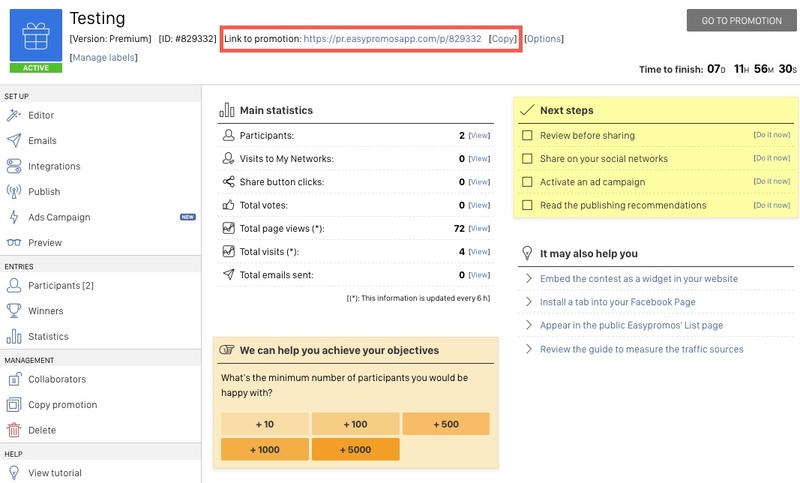 Information about the sources of participants via customized links in the campaigns are only available in the Premium and White Label versions of Easypromos. Export all participants in CSV/Excel format. Each participant’s source will be included. Filter the participants list by source. Create segments of participants by source, and carry out actions on this segment: run a sweepstakes between them, export to CSV, send a mass email, reject, accept, create graphs of participation between segments. From the Statistics section you can view graphs of each of the sources, the daily evolution, and the detail of level 2 and level 3 of each level 1 source. This is useful when the organizer carries out diffusion campaigns, publicizing the promotion across a variety of media and channels. The organizer can define the UTM parameter for each source. In this way, it’s possible to know exactly how many users have registered via each source predefined by the organizer. Let’s have a look at a specific example of how to use the UTM parameters to define various sources; If, for example, the organizer wants to carry out diffusion via newsletter, Facebook Ads and Twitter. We’ll take the following as the main link to the promotion: http://premium.easypromosapp.com/p/1234. You can use the tool to create personalized URLs for your links campaigns. You’ll find it in Publish > Links campaigns. This table lists the level 1 sources, and their respective level 2 sources. The level 3 sources correspond to the value of the utm_campaign. Otherwise, the automatic system will introduce the domain name of the referral URL if it has one. The Easypromos statistics system displays the sources of registered participants, but it doesn’t display the sources of visitors who have not completed the registration process. To obtain this statistic you need to integrate the promotion with Google Analytics and analyze the visitors’ traffic sources from there.